There is no better way to learn anatomy! Build the body from the inside out with Anatomy in Three Dimensions™. Learn the structure and function of bones, joints, muscles, tendons and ligaments as well as the origin, insertion and action of the major muscles of movement by building them yourself on the Anatomy + Movement skeleton. Learn how muscles move by experiencing each muscle group in action and relating these exercises to functional movement. This course covers the body from the knees through the shoulders. The lower leg and arm are covered in additional courses. This two day course includes building the muscles of the torso, hip, thigh, shoulders, upper arms and spine. Exercises to illustrate how the muscles move and how they work together are included to make the information as practical as possible. Covering the body from the knees to the elbow, the lower leg and arm are covered in additional courses. A detailed, full color manual with video support to enhance your learning experience with innovative experiences designed to connect the anatomy to movement. 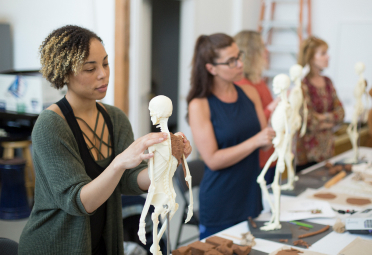 Anatomy in Three Dimensions is also offered as continuing education workshops and in conjunction with our Movement Principles and advanced courses. Balanced Body is pleased to introduce the Anatomy + Movement Skeleton. This scale model is based on actual bones to be as accurate as possible. 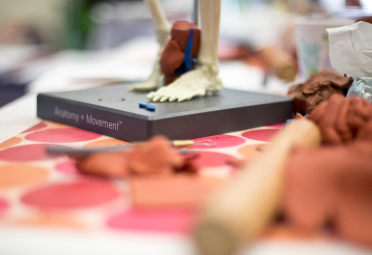 The skeleton is used in our Anatomy in Three Dimensions course and is also available for sale.